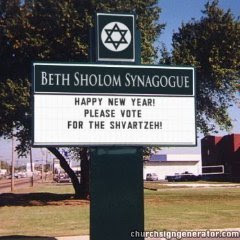 A congregant came up to me during a break in services on Yom Kippur to ask if I'd seen the picture being widely emailed of a synagogue marquee that instructed congregants to vote for Barack Obama. She explained that the sign said "Happy New Year! Please vote for the shvartzeh!" I could sense that she was conflicted about this since she was an Obama supporter but also took offense to the Yiddish term used to denote black people which can be used derogatorily. If you're received a photo of a sign for "Beth Sholom Synagogue" and wondered where this synagogue is, the answer is: it isn't. The sign isn't located anywhere in the real world. It's a fake photo created with software on this website. There are blank church sign templates which allow people to enter whatever they like for the name of the church (or synagogue, or mosque, or what have you) and for the message on the sign board, and it creates a fairly realistic photo of a church sign with their input. Someone used the site to create that sign and then they chose to e-mail it to a lot of Jewish people on Rosh Hashanah. I'm sorry you received it, but I'm afraid there's not much I can do about it. Please feel free to contact me if you have any questions, but again, there's little I can do. I can't control what people type into the form on the site, and I can't control what people e-mail to each other. It's literally impossible to filter every offensive word or phrase that someone can enter, without restricting use of the site for people who use it legitimately. Update: several people have written in saying that they weren't offended and that they thought it was funny, and that I shouldn't worry. I hope I haven't given the impression that I've been deluged with complaints; most of the "complaints" were just people wondering where this Beth Sholom was and why they would put up a sign like that. A couple of people found the message demeaning or disrespectful, and I can certainly understand why they would feel that way. For what it's worth, I personally wasn't offended (it's not impossible to offend me, but it is pretty difficult), but I do think that it was in poor taste and could easily be taken badly, especially given the timing. This template is to be used for fun and that nothing offensive to any group is considered funny, so therefore, people should refrain from using any language that others might deem offensive. SAY SOMETHING at least to guide people, especially after the flap caused and that MANY (I, for example) find obnoxious. Yeah, that'll totally work. I'll be like the security guard in the mall: "You kids stop doing that. Stop it, or I'll... I'll say 'stop it' again, in an even sterner voice!" People who are going to put in something rude aren't going to be deterred by a verbal warning, and people who aren't going to be rude don't need the warning. The only purpose it would serve is to make me look like an idiot. I certainly believe that this sign (on ChurchSignGenerator) was created to be "cute" and funny. It was done with Pro-Obama intentions. However, in an effort to be funny it uses a derogatory Yiddish expression for Black people and thus makes the reaction to the sign more nuanced. Sarah Silverman, in the "Great Schlep" campaign that urges young Jews to visit their Floridian grandparents and encourage them to vote for Barack Obama, certainly pokes fun at many Jewish and Black stereotypes but steers clear of using the delicate term "shvartze". A couple years ago I delivered a sermon about the Yiddish word "shvartze". It happened to be the 100th birthday of Rabbi Abraham Joshua Heschel, the Shabbat before Dr. Martin Luther King Jr. Day, and the Torah reading was Parshat Shemot -- the story of the beginning of slavery and the Israelites' fight against Pharaoh. I spoke about the debate as to whether the Yiddish term "shvartze" is offensive or not (it literally means "black" in Yiddish). When the term is used to refer to a black person, however, it can be a derogatory term and we should refrain from using it. While Blacks and Jews, like King and Heschel, worked tirelessly in the Civil Rights movement, fighting together for equal rights, there have been fractures in the Black-Jewish relationship – and this term, if not taken the way it is intended will only contribute to those fractures. While I like to believe that Jewish people use the term much less today than in the past, I urged those in the congregation to try to avoid using this Yiddish term as it only demeans others and makes the person who uses it look bad and (potentially) racially intolerant. Is the term "shvartze" as bad as using the N-word? I don't believe it is. Had Michael Richards (Kramer on Seinfeld) substituted the word "shvartze" for the N-word, it wouldn't have made news the way it did, but it would have been offensive nevertheless. I concluded with the following: "For too long, our ancestors have used the wrong names to refer our Black brothers and sisters. May we learn from the misdeeds of our ancestors. And may we and our children and our children's children immerse ourselves in learning so that we come to understand the essence of the shemot – the names we use for others. Then will our names and our souls be blessed; and our relationships with other communities will increase in sacredness. May the memories of Dr. King and Dr. Heschel be for blessings and may their efforts toward racial harmony not be for naught." With America's first Black president taking office this January along with a Jewish chief of staff, now is certainly the time for the Jewish community to end its use of the term "shvartze" -- whether it is used derogatorily or in jest. As usual, I am late! I just received this in an email and read your comments. I suppose due to the season we are in, the person may have thought this was recent Yom Kippur news. I see it happened last year. That said, I don't know if it is appropriate to still discuss it. I will go on at any rate. First, I am a Black Jew. Over the nearly 30 years I have been practicing Judaism, I have heard the term used more times than I care to hear it. I want to say that not every time I heard it that I found it offensive; but there have been times when I did. My personal opinion is that the term has adopted a tone over the years synonymous with the n-word; which I obviously find offensive. That is not to say that it has the same meaning because literally translated, we know it does not. Unfortunately, the world in which we live today does not afford us the opportunity to always know when one or the other particular meaning is intended. Therefore, my recommendation is in agreement with yours, that the use of the term is simply ended. I love this post. Thank you so much for posting it!